Somewhere Different | because there's something to be said for a really good lie. because there's something to be said for a really good lie. I’m really good at having ideas, generally speaking. All the time, I’m being hit from left field by ideas for things to write about. Admittedly, I have about seven or eight ideas that I squeeze and cobble together with the new ideas to make them even better (I hope!). The thing is, sometimes I’m waiting for that spark. I was lucky enough to get that spark with my NaNoWriMo novel, and I’m hoping to get it with the next novel I plan to write, since it still needs to be plotted and tweaked and revised before I even begin writing. So, occasionally, I will start cheating. Creative Writing Prompts—love these, so many, so random, so good at sparking your brain! Prompts from Writer’s Digest–even more prompts than the above link, and you can share them on the site. If you get a short story, or a novel or an epic poem or anything else out of these prompts, let me know!! I would love to check it out! Drop me an email or a comment, and let me know if you’re taking the prompt plunge! I’ve been ruminating on the topic of race a lot lately. I know its a touchy subject because once people get to talking about, it’s almost certain that someone is bound to get offended or be embarrassed or any multitude of emotions, even if all of the people in the room are of the same race, let alone if there are people of two or more races in one room. Boy. I think we’ve all been in that situation, whether friends have gathered and the conversation veered in that direction or a classroom discussion, generated by by a reading, or a movie. I’ve recently (last week!) transferred to a university far more diverse than the one I used to attend, where I was one of just a few black people. Now, I see many more black people, white people, Asian students, people of Arabic and Indian descent—every single day. But I only know what it’s like to be one race, and the struggles and challenges presented by that. I have no idea what’s like to be bi- or multiracial, but that’s exactly the life depicted in Heidi W. Durrow’s The Girl Who Fell from the Sky. Durrow tells the story of Rachel, the child of one black parent (a military G.I.) and one white parent (a Danish woman). Tragically, at a very young age, Rachel is the only living person in her immediate family, and she’s forced to move into a mostly black neighborhood and live with her strict grandmother. Suddenly, Rachel, who’s never really be forced to see herself as one race, is living in a world that wants her to choose—white or black. As the story progresses, the reader is also treated to the general ups and downs a young girl might face. Rachel has to deal with fitting in at school, puberty, boys, and doing all of the self-evaluation every young person goes through. Durrow paints her world with such painstaking depth and truth, that in moments of the novel, I honestly felt as though she could have been writing moments from my life, from the couch of my living room, jotting down the words of my aunts and uncles. All of this is mixed in with a little mystery, and the reader is kept in the dark about some of the events surrounding Rachel, which keeps the story chugging along as the reader is left to question, how, when and why? Rachel is such an accessible character, because even though her racial identity is such a huge struggle for her, it’s just one facet of the other ways she chooses to identify herself. The great thing about this novel is that it doesn’t deny the effect our race and it’s history has on us. But it does beg the question: Is that all we are? Does that really have to be the only way to define us? I think that many of us would say, “No, of course not,” but it happens each and every day, from people of all races. The Girl Who Fell from the Sky challenges that, and shows us, through Rachel how to break out and away from that mindset. So, what topics, big or small have you been thinking about lately? 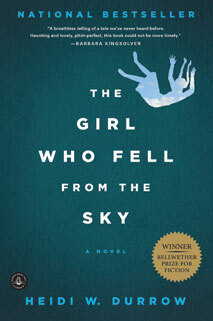 Have you read The Girl Who Fell from the Sky? Or maybe you’ve heard Heidi W. Durrow speak? Let me know, leave a comment below! To hilarious and apropos not to post! If only it were true. This won’t be the first time I’ve discussed an Audrey Hepburn film. And it probably won’t be the last. Regardless, Wait Until Dark is amazing. You need to watch it. In your house. Alone. With all the lights out. You will be terrified, and it will be awesome. If you’ve never seen it, the 1967 classic staring Audrey Hepburn and Alan Arkin, is based on a play of the same name. The film opens with a woman, Lisa, in Montreal,waiting for an old man to sew bags of drugs into the body of a cloth doll. She catches a flight to New York, but when she gets off the plane, she sees a man watching her, and gives the doll to someone else for safe keeping. Hepburn stars at Susy Hendrix, a young woman who was blinded in a car accident. She lives in a basement apartment in New York City with her husband, professional photographer, Sam. Sam was the man to whom Lisa gave the doll. Lisa calls looking for it. Sam and Susy can’t find it. Uh-oh. Two men, Mike and Carlino enter Susy and Sam’s apartment while both are away. They were supposed to meet Lisa, but are instead greeted by a man named Roat (Arkin). And Lisa’s dead body. Turns out, Lisa was in business with Mike and Carlino before they both ended up in prison, and she planned to cheat Roat out of the money from the drugs, until he caught her at the airport, after she gave the doll to Sam. Following so far? He’s tracked the doll to Sam and Susy, but doesn’t know much else, but since he’s worn gloves and Mike and Carlino have not, their fingerprints are all over the apartment, and he forces them to help him get rid of Lisa’s body and help him find the doll. Then, one of the most suspense plotlines ever really begins. Sam and Susy’s neighbor both leave—Sam has a business trip—leaving Susy very much alone. Mike, Carlino and Roat begin a complicated con-game, playing on Susy’s blindness. As the con-game gets more and more tangled and Susy begins to slowly catch on to what’s going on around her, the tension builds for the characters and the audience. In a stroke of brilliance, Susy decides to put the con-artists in the dark, by literally killing all the lights, making them just as blind as she is, ensuring things are about to get really ugly and really scary. They do. The writers already make things suspenseful because the audience knows way more than Susy. We know right off the bat these are bad guys, and it is torture for the audience to watch her invite them into her home, and see them play multiple characters and do all kinds of things she can’t even see! SO. FRUSTRATING. Then there’s the physical tension, with the slights slowly going out one by one. And then there is one of the most frightening scenes in cinematic history, I kid you not. I refuse to provide a link to the footage. Go watch the movie. Get inspired. 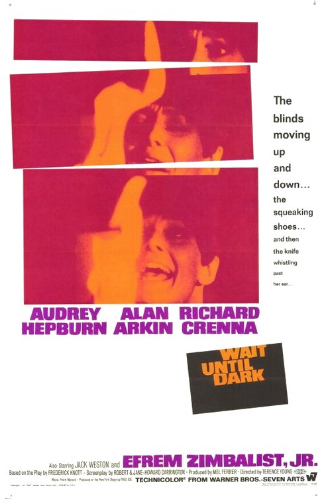 Have you ever seen Wait Until Dark? Did you get scared? Isn’t it exhausting? Let me know—leave a comment! Sadface. Normally, I would take today to talk about something I’ve read and how it shaped my writing, but I moved into the dorms at a new college today, so I am just plum tuckered out. But you should watch the Winter Premier of Pretty Little Liars, which airs tonight in less than FIFTEEN minutes! I’m of a group of people who think there’s something inherently wonderful and depressing about New Year’s Eve. Without being Debbie Downer, I recognize the melancholy in it. Unless you had a truly amazing year, you’re probably looking back at 2011 and thinking: I wish I’d done that differently. But I’m trying to teach myself how to embrace the bad, along with the good. In 2011, I broke down in tears in the middle of my living room because I realized I couldn’t go back to the life I was living in. I wasn’t in the right place, and no one could change that but me. I took a semester off. I cried some more. I worried my mother. I fought with my family. I had ups and downs. I fought with my best friend, I said venomous, awful, hateful things. I transferred schools, I laughed through the tears. I made apologies. I finished a novel. I started this blog. I literally changed my life. But I think I lied. I do. I want a few things for myself and out of 2012. 1. I need to write more. 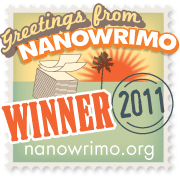 I’m so proud of the novel I wrote in 2011, but I need to venture into more screenwriting. And I need to go it more often. GOAL: Outline my screenplay from now until the end of March. Bring it. 2. Edit 2011’s novel this summer. 3. Update the blog more often. 4. Remember why I changed my life to begin with. So here’s to you 2011. You were crazy, heartbreaking, silly and outrageous, but your time is done. Hello to you, 2012. May you be as equally crazy, heartbreaking, silly and outrageous, though I could do with a little more beauty, less procrastination and a lot more luck. That would be great. I’m a very avid reader, though I do suffer from the go-go-go mentality of the rest of nation/world, meaning I don’t take as much time as I should to enjoy the things I like, such as reading. However, now that I’m older and looking toward a career that is centered around writing, I’m taking time to go back and look at old favorites and figure out what it was about them that made me so attracted to writing in the first place. 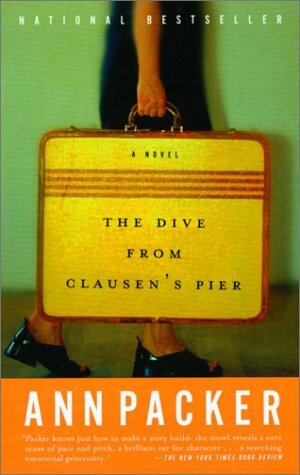 I read Packer’s The Dive From Clausen’s Pier when I was a senior in high school, so not so very long ago. I’ve probably read it four or five times since then, and it’s time to revisit it again. The book is about Carrie, a young woman who recently graduated college. She’s been with her boyfriend, Mike, since they were high school students. As the novel begins, Carrie laments about how stuck she feels. She’s been with the same man, had the same friends and been in Madison, Wisconsin for years. What’s worse is she and Mike are engaged, but she’s not sure she even loves him anymore. She, Mike and their friends go to Clausen’s Pier Memorial Day weekend. Mike dives off the pier and suffers a terrible neck and spine injury, and becomes quadriplegic. For a while Mike and Carrie pretend they don’t know their relationship has come to an end. Carrie struggles to stay by Mike’s side, not because of his injury, but because what was between them has faded. Carrie throws herself into anything else: her sewing, her work, her mother, as long as it keeps her away from Mike. After running into a friend from high school, Simon, who now lives in New York City, Carrie gets in her car, and heads for New York too, without a warning word for anyone—including Mike. Carrie’s fresh start awards her with new friends, new places—and a whole new life. Including a mysterious and enigmatic lover, Kilroy. Carrie dances between Kilroy and Mike, New York and Madison, and tries to find herself along the way. Her guilt keeps telling her to go back, but her freedoms and her love for the city keep telling her to stay. I won’t say here what Carrie ultimately does, but Packer weaves a wonderful tale to get her there. I think this is an appropriate time to think about this book, or at least is for me. With a new year beginning soon, and another behind us, this is always the time people start thinking about how they’d like to change (coughNew-Year’s-Resolutionscough), and that’s what The Dive from Clausen’s Pier is, thematically. It’s all about change, and Packer writes perfectly about all that encompasses change—how it’s terrifying and exhilarating and thrilling all at once. I often think of this book and Carrie’s journey along with this quote by William James: “To change one’s life: Start immediately. Do it flamboyantly. No exceptions.” What’s great about The Dive From Clausen’s Pier is that Carrie does just that. I’m not saying that she’s right. And I’m not saying that she’s wrong. I’m just saying that Packer paints a picture of someone choosing their own life, and she does it deftly. Why you should be watching: Why not? It really doesn’t matter which version you see, because both are pretty good, though if I had to say, go for the 1974 version first, but you’ll be pretty happy with the 2006 version too. It’s like this: there’s a sorority house. And killing ensues. Blood, guts and gore. All with nice Christmas ambiance, and even nifty, Christmas-y ways to die. Give this one to: Your friends. Chances are they won’t mind the gore so much, and the twist on what we think of as Christmas movies will be fun for all of you. 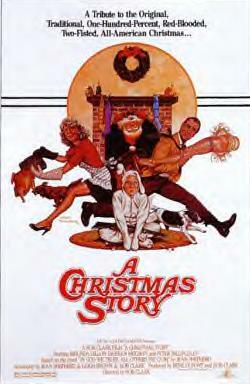 Tim Allen and Jamie Lee Curtis star as Luther and Nora Krank, respectively. Because they’re daughter has just left for Peru with the Peace Corp, Luther and Nora have no desire to spend the holiday season without her. So, instead they decide to take the money they would have spent on presents and a party and the like, and go on a cruise. However, when they announce to friends, neighbors and co-workers that they’re leaving, everyone is outraged. What worse is that, as they’re headed out for their trip, their daughter, Blair announces that she’s on the way home with her fiance (!). The Kranks have to throw together a Christmas party before Blair gets home. Even though you know where the movie is headed from the start, it doesn’t make it any less fun. Give this one to: Your parents. Wherever you are in life, they love you so much, they’d give up a ten-day cruise to the Caribbean for you. Let me put it this way, I started typing the title, and began chuckling to myself. Elf is just plain funny, and genuinely heartwarming to boot. 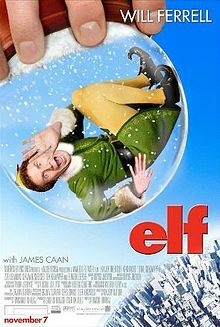 Will Ferrel stars as Buddy the elf, who accidently ends up being raised in the North Pole. Because of his height and because he makes shoddy toys, the other elves discern that he mus be human, and Buddy overhears them. He leaves for New York where is father, Walter, who is unaware of his existence lives and works at children’s book publishing company. Though his father initially rejects him, through a series of misadventures, Buddy is able to work his way into hearts everywhere, and spread the truth and joy of Santa Clause to people all over New York. Give this one to: Your kids/nieces and nephews/little cousins. Elf is family-friendly, reinforces belief in Santa and the power of family. And Will Ferrell in those tiny elf clothes sets even grown men to giggling. 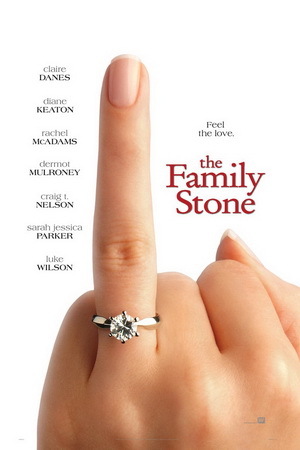 This dramedy features several well-known names in its ensemble cast like, Sarah Jessica Parker, Diane Keaton, Craig T. Nelson, Luke Wilson, Claire Danes and Rachel McAdams. Though seeing too many big names together can get a little New Year’s Eve-ish, this cast does a really great job of letting you forget who they are, and focusing on the story. Dermot Mulroney is Everett Stone, the eldest son of Sybil (Keaton) and Kelly (Nelson). He’s bringing his straight-laced, uptight girlfriend, Meredith (Parker), home for the holidays. The Stones all have issues with their lives and with each other, so bringing each other together for the holiday’s is bound to be a disaster, it is, just in the way you would expect—there’s screaming and fighting, but also some healing, and all families could use a little of that. Give this one to: Your sister, or best gal pal. Hopefully, she’ll enjoy the family dynamics, and it’s great to see so many amazing female actresses gathered in one place. Ralphie Parker is nine years old, and all he wants for Christmas is a Red Ryder BB Gun. I couldn’t even begin to cover all of the crummy things that happen to Ralphie during the holiday season, but they are plentiful and hilarious. Ralphie is just a kid, trying to survive until Christmas when he finally gets to unwrap his presents but bullies and teachers and parents all get in the way. You’ll spend the whole movie hoping with all your might that Ralphie actually gets his little BB Gun, but wondering all the while if it’ll happen. Just watch it, with everyone you know. Repeatedly. Give this one to: Everyone, but most specifically, your boyfriend/husband or your brother. Chances are, he’ll see a little of himself in Ralphie. What do you think? Are my Christmas favorites great, or did I miss the mark? What are your Christmas classics? Let me know! The above is the poem “antidepressant,” by poet Jonathan Stutzman, and one of my very favorites of the selection. I started following Stutzman on Tumblr at thedustdancestoo over the summer and I am never disappointed. His poems almost always seem to reflect brief moments in time, capturing a slice of senses and emotions at the same time. Below is “in fine,” a longer, but no less wonderful poem. These are more recent but thedustdancestoo has been going strong since December of 2009, and there is a lot there to offer. Stutzman’s poetry has a way of boiling down a moment to its most intense and truest emotions. The poetry is extremely readable and equally relatable, so you should really go read some. Like, right now. Seriously. If you’re as moved by Stutzman’s poetry as I am, you should check out his recently released book, empty, now on sale! It’s on my Christmas list for sure! If you’re as into Stutzman’s stuff as I am, leave a comment! I promised myself I was going to do this week’s watching post about a movie, but I couldn’t resist. 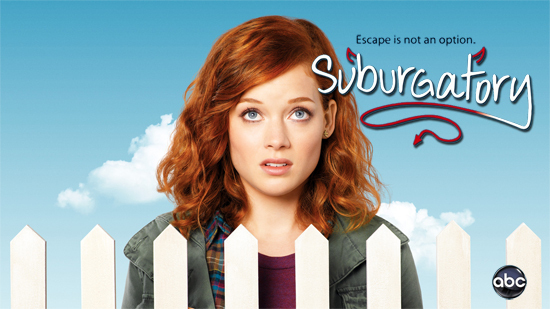 I’ve become so addicted to Suburgatory. Created Emily Kapnek, ABC’s fledgling sitcom has me cracking up. Every week. I thought it would be funny based on the trailer, but it surpassed my expectations. The show chronicles the adventures of Tessa (Jane Levy) a fifteen-year-old high schooler who is uprooted from Manhattan, and moved to the fictional affluent suburb, by her father, George, played by Jeremy Sisto (who you may remember as Elton from Clueless!!). After finding a box of condoms in Tessa’s room, single dad George decided its time for a change. Neither one of them knew exactly what they were getting into. Everyone and everything is Chatswin is expected to fall into one mold, so much so that it’s almost like the town and everyone in it is one giant organism. Everyone drives the same kind of car, wears the same kinds of clothes, and has similar homes. Parents are obsessed with staying young and hot, and depending on who they are, they want to either be the cool parents, or the best, or some fusion of both. The point is, once the writer’s immerse you in the Red Bull-swilling, perfect-lawn-having, country-club -going culture of Chatswin, you are there. Sure, the writers play on stereotypes and draw on other works (The Stepford Wives, Mean Girls) but even when you know what kind of people to expect in Chatswin, you never know what’s going to happen, especially as square-peg Tessa struggles to forge a life for herself in this round-hole world. The entire cast is brilliant, whether they get to crack the jokes, or play the straight man. Cheryl Hines plays the sweet, if silly Dallas, mother to high school queen bee Dahlia. And she is seriously wonderful. Then there’s crazy-stupid Dahlia (Carly Chaikin, of The Last Song) herself. Check out these two in the clips below. Lastly, Suburgatory does what any great show/movie/book does. The writers do a really great job of blending genres. Just as you’re cracking up, the show slides right into a sweet moment. It’s emotional without being schmaltzy, and funny without being over the top. It’s clear that George and Tessa love one another, though they may struggle with forging along without Tessa’s rarely-mentioned mother. In the first episode, Dallas takes Tessa shopping so that she can better assimilate to life in Chatswin. She walks on her in the changing room to see Tessa in this God-awful very functional sports bra. At the end of the episode, she brings her a lacy pink bra, simply because she knows Tessa doesn’t have anyone else in her life to do it for her. That Dallas can go from saying things like “Oh, I don’t eat in public,” to bringing Tessa’s favorite band to her sixteenth birthday party, really highlights that the show and its writers are paying attention to life, not just genre. BONUS: If you haven’t been watching, you’ll love Tessa. She’s feisty, funny and bold! So what do you think? Do you watch Suburgatory? Do you crack up every week? Plan on waching it now? Let me know! I'm a 19 year old writer in love with all things fiction. I believe that fiction is essentially a lie, with love. If in the process of lying, you find yourself drinking too much coffee and playing around Twitter and Tumblr, we might be kindred spirits. Enter your email address to receive awesome updates from this blog and share in the process of writing with me!